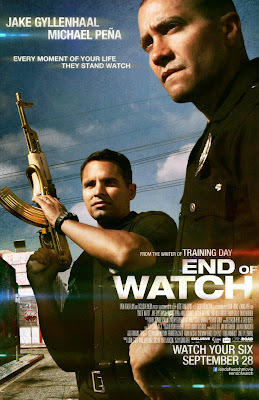 For a little perspective on my thought process going in to seeing "End of Watch", you should know that I've never really been a fan of Michael Peña or Jake Gyllenhaal and I always thought David Ayer's highly regarded "Training Day" was a decent movie but nothing spectacular. With that in mind, the trailer for Ayer's latest film about cops still didn't do much to draw me in, but of course I was willing to give it a chance. "End of Watch" begins with officers Brian Taylor and Mike Zavala (Gyllenhaal and Peña), best friends and partners in the LAPD, getting caught up in a high speed chase that turns in to a deadly shootout. This becomes the first major incident in a series of events that put the two men on the radar and earn the respect of not only their peers, but a criminal element that wants to see them put out of commission. Even while all of this is going on, the two men manage to live personal lives that include Zavala's wife Gabby (Natalie Martinez) having a baby and Taylor building a relationship with his new girlfriend Janet (Anna Kendrick). As their lives and careers continue to reach new heights, the two men grow as individuals and as a team both on and off the job, but even that might not be enough to stop a growing criminal threat that wants to see them taken off the streets permanently. Writer and director David Ayer has previously been responsible for writing and/or directing other movies including Training Day, The Fast and the Furious, Street Kings, and S.W.A.T. so it is very clear he understands how to make a movie about police officers. What is most impressive about his combined effort of writing and directing this movie is the relationship between the two main characters of Mike and Brian. The conversations they share while driving around in their squad car are absolutely brilliant in how natural they seem as well as just being flat out entertaining to watch. The two actors fit their characters perfectly and you really believe that these two policemen from who come from very different backgrounds have been through a lot together which has led them to become the best of friends. Visually, the movie features a combination of traditional camera shots and camcorder footage which comes from multiple perspectives including a camera Brian is using to document their on-the-job exploits for a school project. I was afraid this technique might end up being too gimmicky, but it was used very wisely and puts you right there in the middle of what is going on and adds to the intended realism of the story. 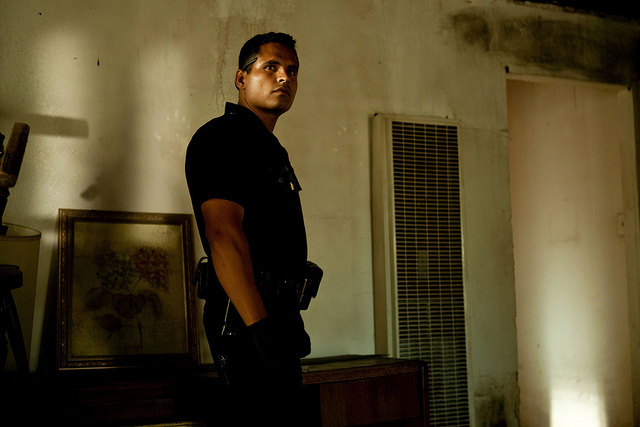 "End of Watch" is a surprisingly intense thriller that draws you in with genuinely likable characters and then throws you in to the middle of a story that will leave you shocked at how it all plays out.